This 3.5 mile round trip hike features a pleasant walk past beaver dams, as well as walking on top of an old beaver dam and on to the featured attraction of this hike, Stony Pond. There is a lean to with a picnic table in front of the pond, making the perfect place for lunch or a break. When you hike this section of trail, you'll see why we've included this in our "best of the North Country Trail". Officially, this is not the North Country Trail. It is just the planned route the trail is scheduled to take as part of its journey through Adirondack Park. We have more information on the complete planned route at our North Country Trail in the Adirondacks page. The Stony Pond Trail will be used as a "connector" for the future North Country Trail. The future NCT will use the northern branch of the Stony Pond Trail toward Hewitt Pond from the lean to. The future NCT won't go all the way to Hewitt Pond. A future trail will be built south of Barnes Pond that will bring the NCT toward Bailey Pond in Hoffman Notch Wilderness. This hike is located in Vanderwhacker Mountain Wild Forest and the trailhead is located on NY 28N, north of Minerva. There is a DEC sign and parking along the side of the road. The GPS coordinates are N43 49.967 W74 00.971 for those who have a GPS devise in their vehicle. This hike can be done along with the Hudson River Bridge hike for those looking for a little bit more. 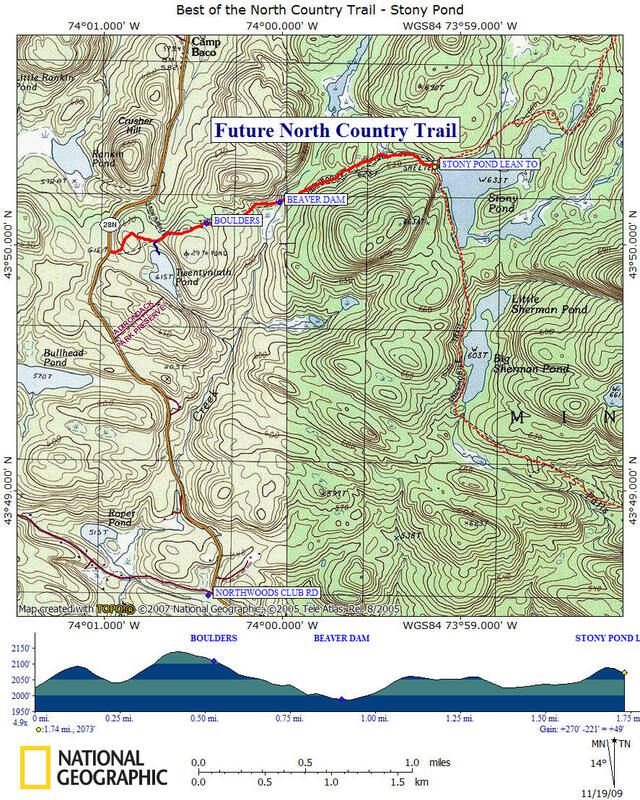 Look below for a few pictures, a video, detailed description and map of this hike along the future North Country Trail. From NY 28N, follow red trail discs into woods along wide path. Shoulder parking. Soon trail register. Unmarked side trail on right leads 0.1 mile to Twenty-ninth Pond. Pass a "jumble" of boulders on your left. The trail crosses over a beaver dam. Another beaver dam on your left. Ascend. Trail passes through a very wet area. Pass the edge of a wet meadow. Reach Stony Pond and the Stony Pond Lean To. End of this hike. The future North Country Trail will use the trail to the left of the lean to toward Hewitt Pond.